26th August - 4th September. Direct, we beseech You, O Lord, our actions by your gracious assistance, that every prayer and work of ours may always begin from You, and by You be happily ended, through Christ our Lord. Amen. We salute you Mary, Queen of heaven and earth, Mother of Consolation. Mindful of the power with which Jesus your Son has blessed you, we implore your protection as the source of all true consolation. After the trials and sorrows of our life's pilgrimage, you can console your children with the glory of which you are the dispenser and with the joys of paradise of which you are the gate. May our poor efforts to love you, dearest Mother, be helped by your more than maternal care. Deign then to listen to your children's prayer, and grant us the grace that we ask in this Novena...(pause) O Mother of Consolation, grant that, under your care and protection, we may reach the home of eternal rest, where we may for ever bless your Divine Son. Amen. O Mary, Mother of Consolation: pray for your children. 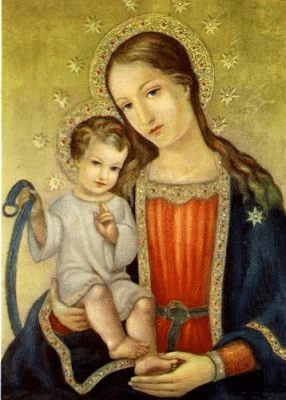 Remember, O most loving virgin Mary, that never was it known that anyone who fled to your protection, implored your help, or sought your intercession was left unaided. Inspired by this confidence, we fly unto you, O virgin of virgins, our mother. To you we come, before you we stand, sinful and sorrowful. O mother of the Word incarnate, despise not our petitions, but in your mercy hear and answer me.